It is a complaint heard many times on tee boxes and driving ranges—”I’m swinging over the top.” As much as golfers make an effort to check this fault, very few are successful. In this edition of On the Lesson Tee, PGA Professional Todd Kolb elaborates on the ‘Over the Top’ swing – what it means and how you can stop doing it. Todd begins the lesson by noting that having an over the top swing is one of the more common mistakes observed by golf instructors among golfers of all levels. Understanding what the phrase means is a good start to fixing the problem so Todd goes on to explain what is meant by a golfer making an ‘over the top’ swing. Ideally, a golf instructor wants to see the club and hands travel below the right shoulder as they travel into the impact area. Instead, some golfers have a tendency to swing the club over the top – where the hands and club travel over the shoulder (high) as they move into the impact area–typically leading to a weak high ball flight. In the video, the over the top swing is clearly demonstrated by the contrasting positions. Look first at the golfer on the left, this golfer has her club moving above the shaded blue area and in result is making an “over the top” downswing. The golfer on the right, by comparison, is well-positioned with the hands and club inside the shaded blue area resulting in a high draw that will finish at the target. 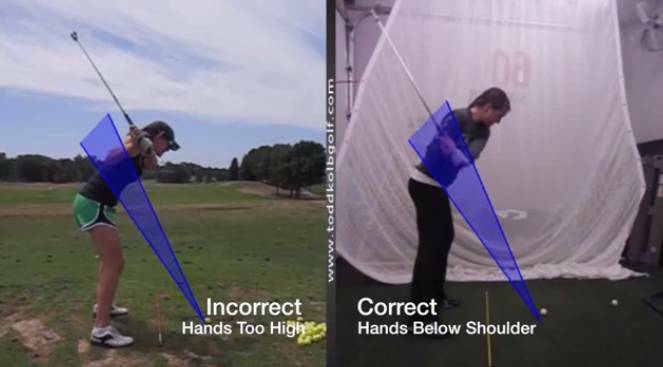 Developing the right posture and physical parameters can prevent your club from coming over the top during the swing. Once you understand the meaning of an over the top swing, the next step is learning a few drills or exercises to eliminate that swing characteristic. There can be many causes that result in an over the top swing – some being physical and others mechanical. According to Todd, one of the main reasons why many golfers display the over the top move is because the body moves faster and gets ahead of the arms and the golf club. To address this problem, Todd presents a simple yet effective practice drill to help you eliminate the over-the-top by counteracting the premature movement of your upper body. 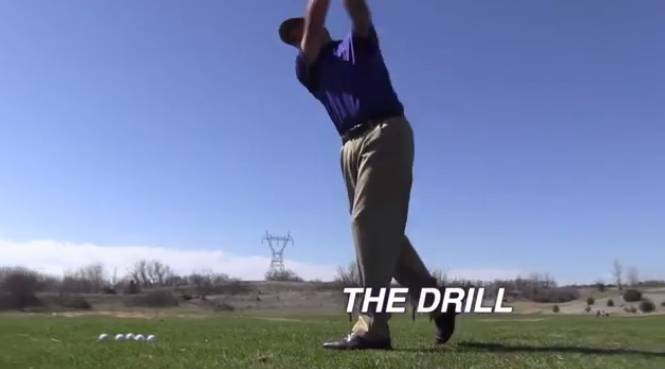 You will notice in the video that Todd prefers a tee for doing drills. He recommends a six iron or seven iron golf club for this specific drill. To start with, you need to place your lead foot so that it is in line with the golf ball. Your trail foot on the other hand, should go straight back – as demonstrated in the video. Once your lead foot and trail foot are in the correct stance, you will feel as if most of your weight is on your lead foot. You can go ahead and swing your arms and club back, then swing them forward in a way that your arms are moving out to the right or right field. As Todd mentions, bottom line is to make sure your body is firmly positioned while your arms swing past your body and out to right field. When your hands and golf club start moving away from the body during an over the top swing, the clubhead follows swinging outwards then down across the target. This results in a major power leak and a slice golf shot. 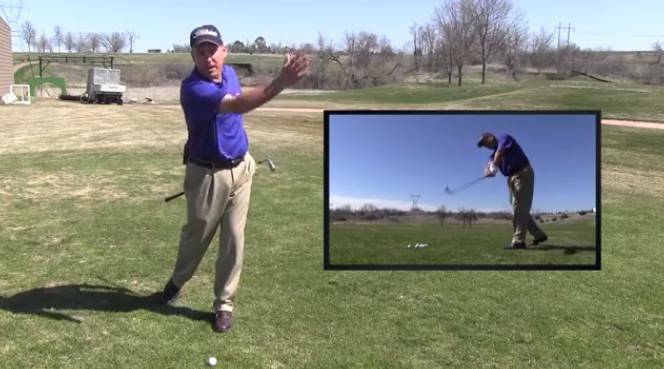 Here’s a great drill on fixing that slice, over the top swing. To resolve the issue of an over the top downswing, there is no better place to start than figuring out why it happens. Taking the time to master certain useful drills will also help you to cure an over the top swing, while making you a better golfer. While there might be several reasons that cause you to swing over the top, regularly practicing with this particular drill can help get your golfing sequence down and improve your chances of hitting a nice high draw. You keep referring to a video – I see no video or link to a video in this article. We’ve re-posted the video within the piece. Hopefully you can see it, now!